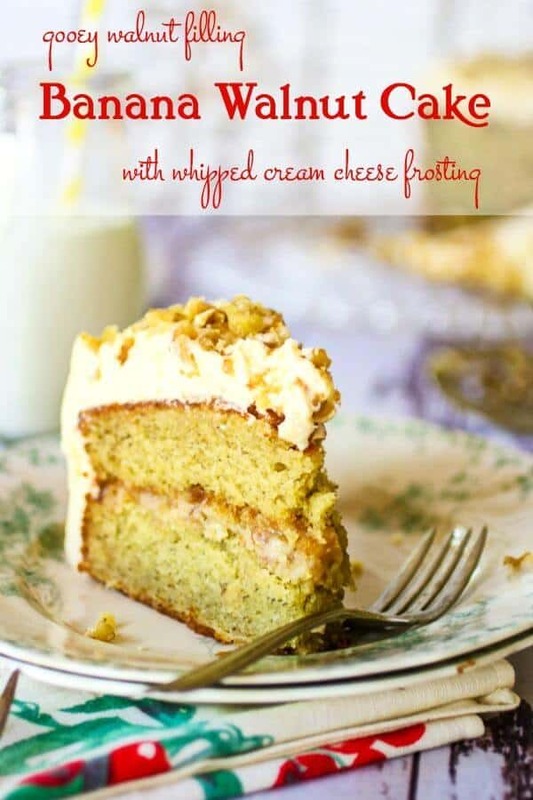 Banana cake with gooey walnut filling and whipped cream cheese frosting is not an incredibly elegant dessert recipe. It is not low calorie nor low carb. It is pure comfort food, straight from grandma’s kitchen — that is if you had a grandma that baked. 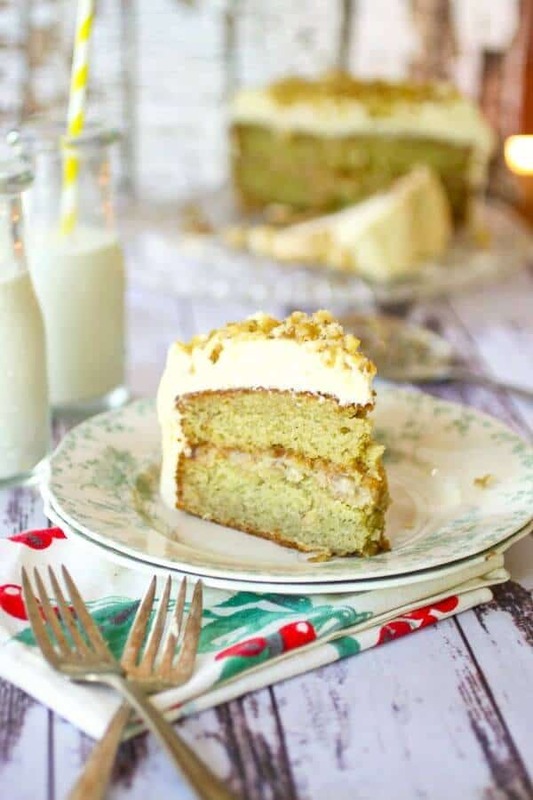 Tender layers of banana cake are filled with a walnut filling (similar to pecan pie), and frosting with a tangy-sweet whipped cream cheese frosting that’s so light it’s like biting into a cloud. This post has been updated from the original July 2010 version. Have you noticed that bananas are not considered upscale? I mean not that many five star desserts start out with a banana. Nope. It is the after-school milk and cake crowd that loves these things. And so do I.
O.k.. seriously. What is not to like about a banana? They are primo comfort food for almost everyone. You bite into creamy, sweet yumminess and in return? You get a ton of potassium. Gotta love bananas. In fact, you may find this hard to believe BUT my family once ate a whole case of bananas in two days….and lived to tell the tale. 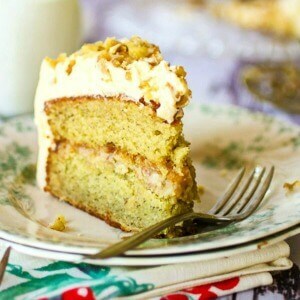 If you love bananas even half as much as we do you are going to adore this banana walnut cake. While I was baking it the whole house was banana scented. The flavor is intensely banana swathed in a cloud of whipped cream cheese – I’ll tell you what, I couldn’t keep my fingers out of it. I am ready for another piece. 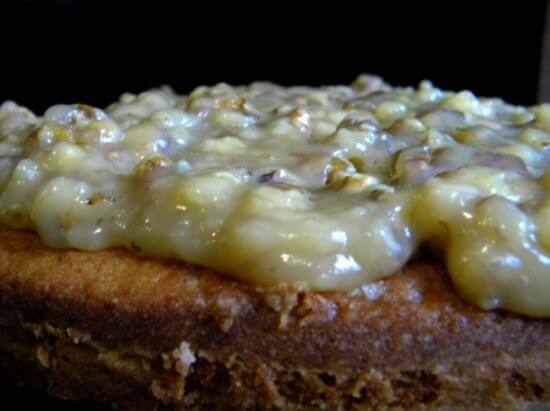 Easy/ Some Experience: This banana cake recipe is good for people who have some experience with making cakes. 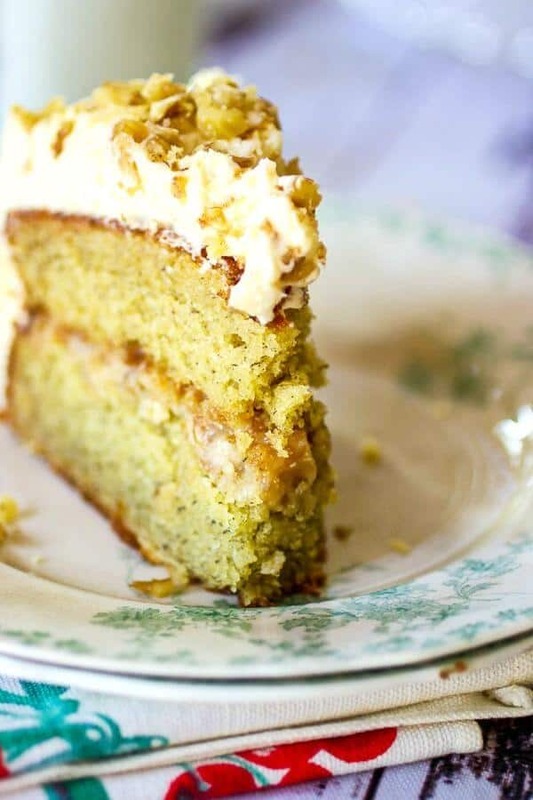 We don’t often have over-ripe bananas around but when we do I make this cake. Here are some tips and tricks to ensure success! Use ripe bananas – the riper the better. Mine were almost liquid on the inside by the time I got around to making this cake. If you find yourself with extra bananas that are about to be too ripe for anything just pop them in the freezer, peel and all. You can thaw them and use them as needed. 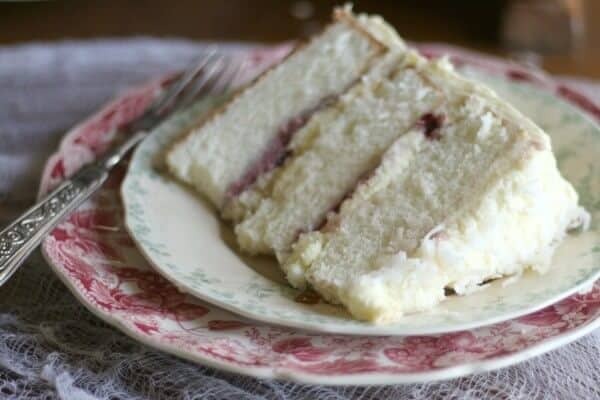 Replace 1 to 2 tablespoons of the buttermilk in the cake with rum for a delicious variation. The cake freezes well but the frosting and filling do not. Wrap the unfrosted layers in plastic wrap and freeze to use as needed. Adding a layer of greased and floured parchment to the cake pan ensures that the cake comes out easily. Substitute pecans or macadamia nuts for the walnuts. The walnuts in the filling are cuddled (yes cuddled!) by a gooey, sweet, rich caramel that is just thick enough to hold them together without being so thick you have to chew. If there’s one thing I love it’s a good, old fashioned cake recipe. 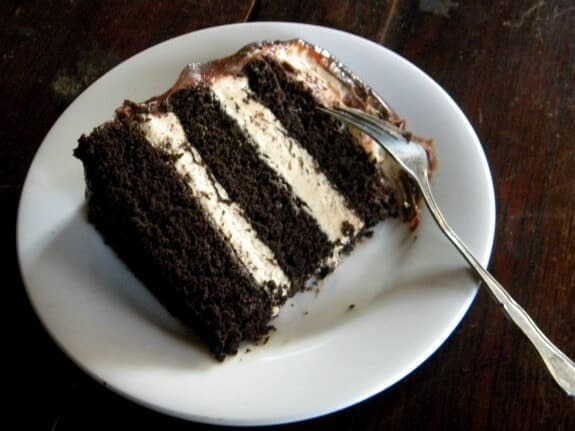 Sure, those pretty cakes that look like unicorns or shoes are gorgeous but I like a simple layer cake swirled with creamy frosting that looks like mom just carried to from the table to the counter. 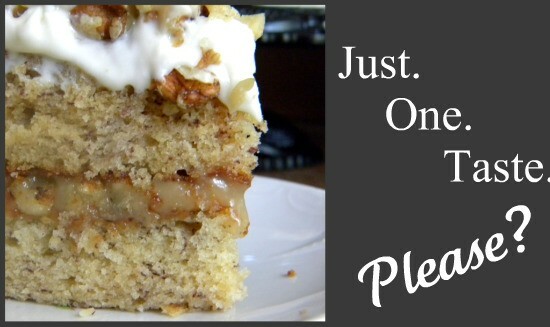 Here are some of my favorite cake recipes here on Restless Chipotle. 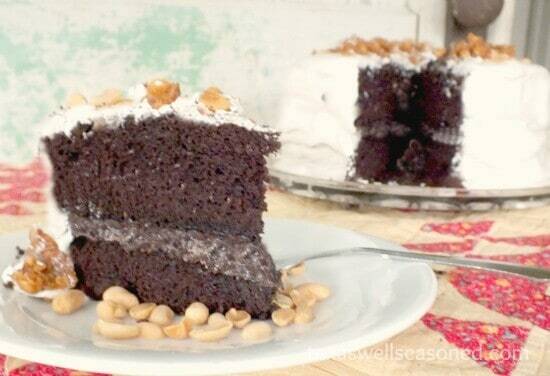 The absolute BEST chocolate mayonnaise cake ever. Pretty orange layer cake with a burst of fresh citrus flavor. Pig Pickin’ Cake is an old fashioned southern favorite. Pineapple Upside Down Cake like mom used to make for Canasta parties. Old fashioned Chocolate Sheet Cake is perfect for potlucks. Luscious banana layer cake is perfect for everything from birthdays to family dinners. Toasting the walnuts gives them more flavor. This is a pretty easy recipe but there are a few things that make it even easier. I love these Wilton layer cake pans because they are heavy and cakes cook evenly. I’ve had mine forever and they still work great. I used to just use my pans until they were awful but I’ve learned to cut myself some slack and “treat ” myself to new pans when I need them. Try these pans and I know you’ll love them. This homemade banana cake is definitely blue ribbon material. Sooner or later it happens to all of us – you walk in the kitchen one morning and the bananas have gone past the point of no return. You’ve got to do SOMETHING and SOON. Never fear! I’ve got you. Here are some great recipes to help you use up those leftover, over ripe bananas! Banana cake is an old fashioned cake. It isn’t fancy, or difficult but it is really, really good. I promise. Good enough for cozy family dinners or dessert to impress the mother-in-law. C’mon… you know you want some of this…. This banana cake with walnut filling is tender, buttery, and full of banana flavor. The tangy cream cheese frosting is the perfect finish for this sweet comfort food. With mixer on low speed add the eggs, beating well to completely mix them in. Blend in the banana and vanilla. Add the dry ingredients alternately with the buttermilk, beginning and ending with the dry ingredients. Bake in 375°F oven 25 minutes, or until a toothpick inserted in the center comes out clean. Combine sugar, flour, butter, and cream in a heavy saucepan. Add the nuts, vanilla, and salt. Spoon between the layers of cooled cake. Beat the cream cheese, butter, and cream until well blended and fluffy. Add the confectioner’s sugar and instant pudding; continue to beat until smooth. You may need to add a bit more or less than specified to get the proper texture. Spoon the walnut filling thickly on top of one of the cooled cake layers. Cover with the second layer, pressing down gently. Frost thickly with the whipped cream cheese frosting. Sprinkle more walnuts on top if desired. Included in Meal Plan Monday – check it out. This cake looks ridiculously good! just like banana bread but better! Ohmygawsh!! This looks incredible! My birthday is coming up, and I’m pretty much a chocolate gal, but I really want this cake! The icing is always my favorite part of a cake. I may not be able to stop myself with this icing. I would have to make extra! Definitely. This is so good. 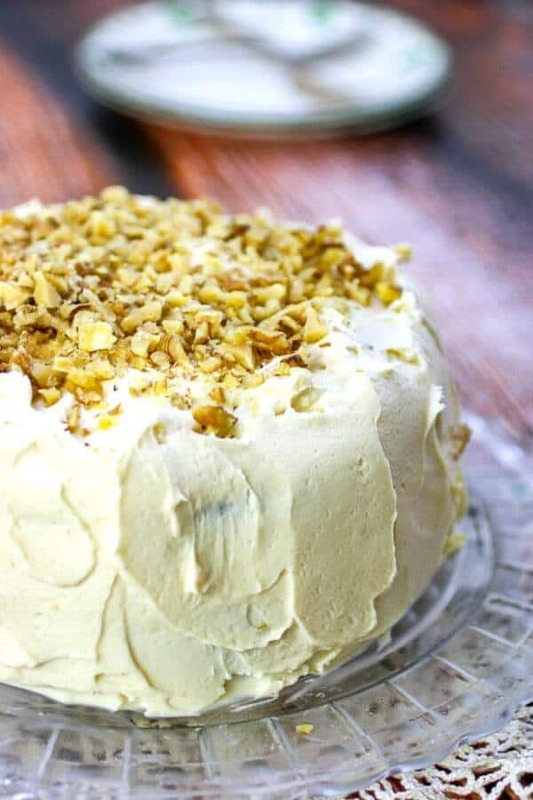 Love banana cake with cream cheese frosting! Once again Marye, you’ve knocked it out of the ballpark! This recipe is absolutely amazing!!!! Every time I take it someplace people go crazy over it! Best banana cake I’ve ever eaten so moist ! Thanks but… Who is Sandy? You definitely got my attention on this one, and I’m not a big fan of bananas. I’ll be making this on Monday. It sounds delicious! OMGoodness Marye. The way you describe this cake is just… just… lets just say very exciting. The walnuts are cuddled by a thick, sweet, rich caramel without being so thick you have to chew it? Oh yea!. Gotta love Comfort food! Sooo, what would you think of ganache over the cake instead of cream cheese frosting? It’s a work of art…makes even someone who doesn’t like bananas drool! I’d bring the refill, hehe. Dang that look soooo good.